Heat pumps provide both energy efficient heating during the winter and cooling during the summer, and are the preferred heating and cooling system for many homeowners in Warren County and the surrounding areas, including Amelia, Batavia, Fayetteville, Lebanon, Liberty Township, Loveland, Mason, Middletown, Monroe, West Chester, Wilmington, and more! Unfortunately, these energy efficient heating and cooling units may experience a breakdown a time or two. When this happens, there is only one contractor you need to know—Rick’s Heating & Cooling. To schedule a heat pump repair, give us a call or contact us online today! We also provide emergency repairs 24/7—call today! 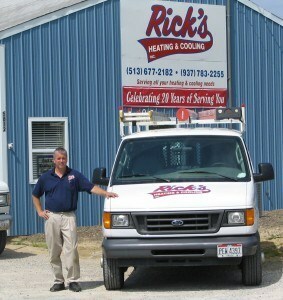 Rick’s Heating & Cooling has been providing HVAC service in Ohio since 1986. Our main goal is to provide dependable, professional service and treat our customers with a level of respect that they won’t find with other companies. We schedule all of our appointments within a two hour window, and we’ll always call ahead so you won’t be left waiting around all day for a heat pump repair technician. We want to be the only HVAC company you ever need! We are a full service heating and cooling company that can assist you with all of your heating and cooling needs. No matter what problems your heat pump is having, Rick’s Heating & Cooling should be the first ones you call! Our heat pump repair experts have been fixing heat pumps throughout Warren County and the surrounding areas for decades. If you need heat pump repair, call us today! Ohio Heat Pump Repair—Call Today for Service! Our Morrow, OH based company can help find the professional solution for any of your heating and cooling repair needs throughout the Cincinnati area, including Amelia, Batavia, Fayetteville, Lebanon, Liberty Township, Loveland, Mason, Middletown, Monroe, West Chester, Wilmington, and more! Before you search, “heat pump repair near me”, call the experts at Rick’s Heating & Cooling to get a quote and schedule a repair.